Super Cars is a game that has it all, when it comes to car games at least; cars, racing, power-ups and the ability to earn money, all in one game! 'How can one game manage that?!' I hear you cry? Well, I don't know as I'm not a programmer, but those geniuses at Gremlin Graphics have managed it. No more just playing a car game just to do racing or just to earn money and upgrade; this one has it all. Including missiles. Do you do finance? No? Erm....ok, can I just have a look then? Super Cars starts you off with the above screen, where you can see some cars for sale, your racing track selection and where you can access the garage to make upgrades to your current car. Starting off with £5000, you may well think you can get straight into that garage and get your car super suped up; but alas this garage is a little on the high end when it comes to prices; even in 1990. There are a few things within your initial budget but, if you're looking to add more than one extra to your car, you will struggle. How many you think you'll need before your first race is up to you really, not that you have much choice in the first instance. Personally, I just like to play without adding any extras and look to get a bit more cash in the kitty before getting excited. As with most games, the early levels - or tracks in this case - start off relatively simple, so getting a good finishing place and in turn more money, is easy-ish to come by. Is that a front missile? Are you sure this is a car shop? Should we go into what you can buy to upgrade your car before actually talking about gameplay? Yeah, ok then. Well, aside from things that we take for granted these days like power steering (remember when that wasn't as standard? Me neither - too young), you can also look to add turbo chargers, high speed kits, side armour and an anti-spin kit. Very nice. Now, and this is where things get a bit military, you have the option to add front and rear missiles. You may think this is a bit excessive but just think to those times when you're stuck behind a Honda Jazz doing 15mph in 30mph zone and then you start to think that they would actually come in handy. Not that you'll see any Honda Jazzes (Jazzi?) in this game (just use your imagination) but you will indeed find yourself with the need to make cars get out of your way should you want to come first. Unless you're a cracking driver like me, obviously. A pointing hand is your cursor through the menu and shop sections of the game but when you've finished equipping your car with missiles and side armour and decide now is the time to actually start racing; there's no cursor to be found (which is good because it would probably get in the way) and you're presented with a top down view of the track. The track itself is simple in looks and your controls are simple too; with 'left' and 'right' turning your vehicle anti-clockwise and clockwise respectively, with 'fire' increasing your acceleration. What you'll also find is an info bar across the bottom of the screen, showing your position in the race, lap counter and the current status of your car in four categories; engine, body, fuel and tyres. Needless to say, the lower these get, the worse it is (what good is car without an engine? Ask any Alfa Romeo owner) so bashing into walls or over accelarting (though both fun) should be avoided. On the road itself you will find the are other cars, which should't surprise you in race really, but nonetheless they do tend to get in your way and ultimately contribute to either stopping you coming first or depleting the energy bars of the previously mentioned status bars. Unless of course, you put your missiles to good use. Is that puddle glowing blue? Either that or Sonic is not as fast as he used to be. This part of the game is where you can put your driving skills into action. You'll find the first level a rather simple affair having just other cars to contend with but the further you progress through the levels, you'll find other hazards in your way in the form of water puddles and oil slicks. The dastardly things! You'll find the races quite fun; sure, at first you'll find the your car only runs at the speed as the aforementioned Honda Jazz but win a race or two and you'll be suped up before you know it. Initially, you'll be up against another four vehicles who have their own strengths and weaknesses; these are easily beatable to start off with as, even though you don't have the fastest car, if you're nimble enough with your turns you'll find yourself high up the podium. You may look at the first level and be a little unexcited at the look of the track, you'll be forgiven for this but as you progress the tracks get longer twistier (is that a word?) and with the extra hazards (including extra cars) it becomes a very exciting and fun challenge. I can't believe I haven't mentioned how fun the missiles yet! (What's wrong with me?) Yes, should you earn some cash from your racing efforts and you decide you want to treat yourself to a missile, (why wouldn't you?) why not take to the roads and see what damage you can do. Though you can only buy one at a time, it's still fun none the less as you take aim and take out that Jazz. A direct hit will disable the car for the rest of the race so why would you not want to do this? Plus you get to play with missiles. Ok, ok - who's the wise guy who brought a motorbike? I clearly stated this game was called Super CARS! At the end of each race you'll be presented with the above screen which will inform you of your stats for the race; the race number, the position you finished in, along with a few others but most importantly, how much money you've won. Head back to the main screen and head to the car shop - it's time to fix your tyres, add some fuel and buy a missile or two! On to the next track you go and start racing again, earning some more moolah and making your car speedier (is that a word?) and more dangerous, taking out cars and leaving them in your wake as you speed on to victory. Very satisfying. Not only can you make improvements to your car, you can also buy a completely new one. Wow! Though slightly more expensive than adding extras to your existing car, isn't it nice to be able to go into a garage and choose a brand new car that no one else has driven before? Hey, they might even chuck in a warranty if you ask nicely, though expect a sarcastic reply if you don't have enough cash. This game is so life like! Pfft. Typical salesman. I only offered him £10K below the asking price and this is the response I get? I shall take my business elsewhere! 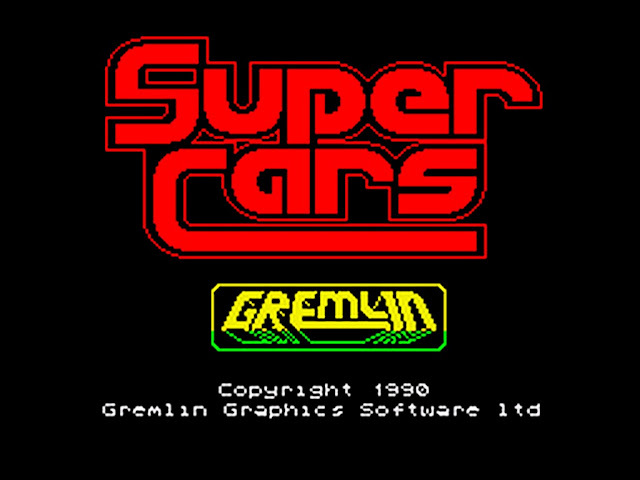 Super Cars is one of those games that doesn't seem to get mentioned much; I'd pretty much forgotten about it until I saw it mentioned elsewhere, which is sad as this really is a well constructed game. Yeah, the animation is little jerky on the races and the noise your car makes when you brake will have you pulling that weird squinty face but, it does have some banging music to make up for it. A lot of detail and features are contained in what in theory is a simple game, but there's a whole lot going on. The ability to improve your car and add lethal accessories really do add to the addictive-ness of this game. You really will just want 'one more race' and then end up playing it until the early hours - just like old times. If you've not played it before - fire it up! Disappointment is not what this game does. But make sure it's the 128k version as the 48k version is absolutely nothing like the review you just read. Probably should have mentioned that earlier.....oops. Like what you read? Follow me on Twitter, if you like @florinthedwarf.